When she arrives at Kensington Neighbourhood House on Wednesday nights Gregoria is always tired out. For the 41 year-old, Wednesday is the busiest day of her working week at the University of Melbourne. KenSingers kicks off at 7.30 pm. 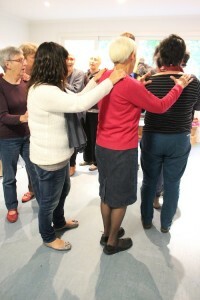 Each session includes vocal exercises, something old to practise and something new to learn for the choir’s repertoire. 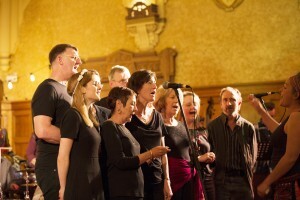 The choir is a mixed group with people aged from 19 to 69, men and women from all walks of life. Tom, 19, is the youngest member who joined because singing offers a good contrast to his full time studies in computer programming. Vocal warm ups limber up voices and break the ice. Choir director Jo Windred leads the group in some warm-ups and the group circle the room limbering up their voices, flexing their vocal chords and making a happy racket. What’s obvious watching this group is that any worries or tiredness is left at the front door. With their heads back, eyes closed and mouths open in song you can see how good singing makes people feel. Since the ‘Choir of Hard Knocks’ made community choirs famous, they have mushroomed around Australia. Often auspiced by local community organisations including neighbourhood houses, community choirs involve a lot more than just encouraging people to sing. There’s growing evidence that being part of a choir does more than simply make people feel good. 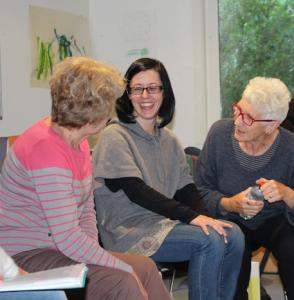 Forming new friendships, developing networks in local communities; improving confidence and getting jobs are just some of the benefits of singing with others. Jane’s research has found that the most successful choirs are those supported by a community organisation that offers the kind of practical support that keeps the choir going – from rehearsal and performance space to advertising in their newsletters. Gregoria (centre) and Anne (right). And the benefits go both ways. Each time a choir performs in public it spreads awareness of the centre that hosts it as well as inspiring other members of the community to think about taking up singing. KenSingers perform at community events from school fetes and festivals to workshops to community events. Choir members are constantly learning with master classes, big sings, workshops and visiting guests.